Another round of Remote Play Reviews, this time with Knack! Knack didn't get a lot of great reviews, in fact Metacritic gave it a 54, but that doesn't mean you can't have some fun with it, especially if you take advantage of some Remote Play and companion app additions. Right off the bat, you can see the controls on the Dualshock 4 are tailored for use on the Vita. No use of L2/R2, L3/R3. That makes it an easy shift over to remote play without any need for control remapping, and so you never have to look up somewhere how to do a combo or whatnot, as long as you know how to play on a DS4, you've got it all under control on the Vita. Graphically, you're looking at a colorful game with lots of story line breaking up the somewhat repetitive gameplay. The graphics translate nicely over to the Vita and technically you're looking at a great transfer of framerate. Throw in another controller while you're playing on the PS4 and big screen, (either a DS4 or remote play controlled Vita) and you've got a two player little game going on. Nice touch! Good. 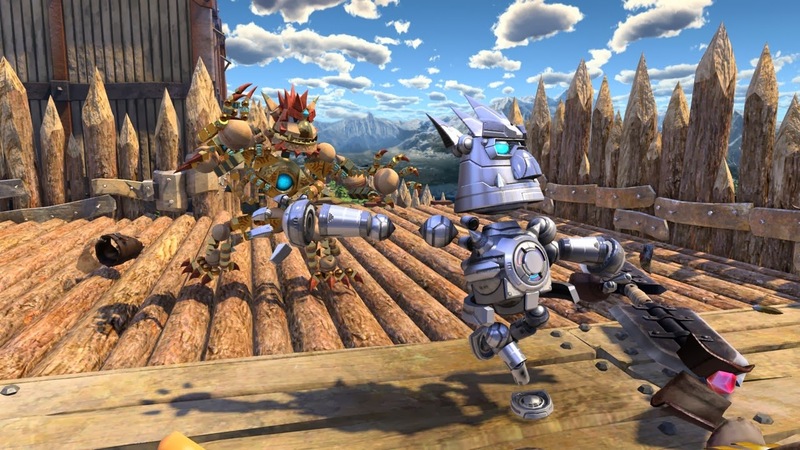 Knack is as easy to play on the big screen as on your little one. - How come Knack's Quest isn't on the Vita?! Missed opportunity!